Stanford University student, Adrian Harrison has proposed a series of work pods and telepresence portals that could bring the office to the worker. In essence, people would be able to walk to the one nearest to their home and find the resources they need to complete the day’s tasks. Image and article courtesy of Metropolismag.com. We’ve transitioned our pictures to DropBox, conversations to Slack and word processing to Google Docs; what happens when we move the workplace itself to the virtual sphere? Forbes shares their thoughts. In this article on Metropolismag.com, students at Stanford’s Architectural Design program say the workplace of the future will mesh seamlessly with the public realm, and that change is already taking place. 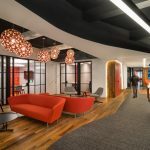 A report released on the flexible workspace market in major cities around reveals that in Australia demand for flexible workplaces has risen rapidly, while in major U.S. cities the market has also continued to grow.